Google Adsense asynchronous ad code though in beta version is an improved version of adsense code with minimal or no latency effect on your site speed compared to the synchronous ad code type we have been using. Google and other search engines have identified the importance of speed in delivering your content to your readers and have long implemented it as a search engine ranking factor in their various search engine algorithms. Google has explained that the asynchronous ad code version will not affect your site’s page speed. Your visitors can now view your site contents even if they are having troubles loading the ads maybe as a result of their internet speed or a bug in their browser. So to ensure faster page speeds and better site performance in general I have decided to switch all the Google adsense codes on my blog to the asynchronous ad code version. Even mobile users can now enjoy less latency while surfing my blog. Simply create a new ad on Google adsense or edit the existing ones, you will notice drop down menu on the Code type field on your ad code section, select the asynchronous ad code and a new type of adsense code will display. 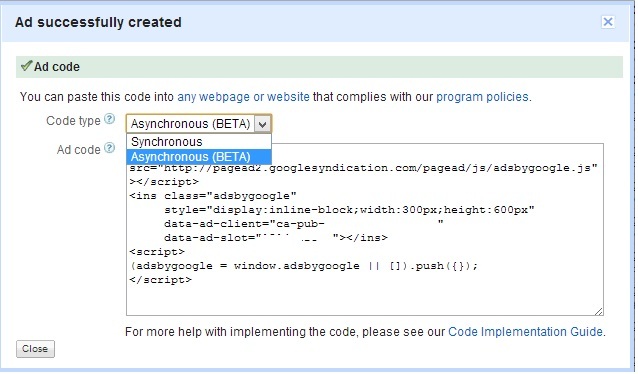 Simply copy the Google adsense asynchronous ad code and replace every synchronous ad code type on your website. Google also advises that to get the full benefit of the asynchronous code, it is recommended that you switch all of the ad units on a given page at the same time so one element doesn’t stop the other from loading quickly. So since am worried about my page speed and site’s performance in the search engine rankings I thought it wise to immediately switch to the new ad type to improve my site speed and of course my search engine ranking. I recommend you do same too and enjoy the benefit of an improved ad type. If you have any questions please be free to use the comment section below. Share your thoughts and view about this topic too. Remember to subscribe to my feed. I too want to improve my site speed by using the new changes Google is rolling out in this department. Not too much up to snuff about coding; the snippets you shared are very helpful to me. Thanks Ryan this will definitely improve my site speed. Nice article on Google Adsense. I am not using Google Adsense but this will help me out, making my Adsense codes in future,. Why exactly are you not using adsense? How do you monetize your blog? It’s really a great update and if using asynchronous reduce the blog load time, then we must use it. Please tell me the solution on how to add adsense asynchronous ads code below post title in Blogger. Google may have already parsed this code before giving it to you so i do not think you still need to parse it again. if the code works without being parsed then i will recommend you use it just the way it came. I haven’t noticed yet. I will check it soon. Nwosu mavtrevor Really adsense has effected site speed hope new Version will overcome this. I am yet to take a page speed test for my blog, but if Google says this new snippet performs better do you have any reason to doubt them? Dear I have tried it but it’s not working without parsing. And with parsed code, ads are not displaying. Google has promised that the new ad code will not affect site speed. Its an improved version of the former code. Asynchronous components are definitely better options to improve your page speed and we know PageSpeed has greater impact these days for ranking. However, do you really think that 3 ad units are causing your site load? I find Google Ads are pretty faster to load, aren’t they? Do you think it is really that important to make change? If Google says i should make a change then i make a change because i want to optimize my blog for speed. I don’t see any reason not to. I’ve implemented the new asynchronous ads on my website about two weeks ago and I have to say I noticed an improvement on page load, however I also noticed that ads take a lot longer to appear, some even 15 seconds after the entire page was rendered on screen. The problem with that? Since I change all the ads to the new code, and I made sure all have the new asynchronous code, I had a drop in ad revenues, like a big drop, my website is an image website where visitors browse images one after another, pages load faster than ads now and I have to believe my visitors don’t even get the time for ads to be shown to them, consequentially a lot less clicks. Maye is that maybe is not, I don’t know, we’ll see how it goes. Your experience is unique if it does not work for you, switch back to the old code. But i have witnessed a 200% improvement in earnings and speed since i switched. i thought I’d implement the new async ads last week. When I checked my adsense account this week my jaw dropped … just like my CPC. While my CTR had improved slightly, the CPC had tanked by as much as 60%. I decided to go into developer and take a look at exactly how much quicker the new async ads are compared to the sync’s so I ran a page speed test using googles PageSpeed Insights tool with the async’s intact. The result was as expected. I then immediately replaced the 3 ads on my sites homepage with the sync versions – dumped the cache and reloaded the homepage. Visually, it loaded way faster with sync ads. Afterwards I re ran the page speed test: For desktop computers/browsers the sync ads dropped my score by 3 points – BUT for mobile devices the sync ads actually increased my websites score by MORE THAN TEN POINTS! So, considering the huge drop in my CPC and the very slight drop in page speed with the added benefit of super duper mobile loading, there’s no question for me …. I’m going back to sync. To each his own … but the ultimate determining factor gets deposited in my bank account around the 24th of each month – and with async ads, unless it was just some sort of fluke, that amount would have been dramatically way less. One last note, I must agree with nwosu that when google makes suggestions – as publishers we should definitely take notice – but async ads are still in beta and they employ iframes – which I try to limit on my site. Async ads load visually slower (which is a good thing if your site isn’t fast already – allowing for your content to load first and then the ads) but for an established site that loads really quick regardless of adsense i would suggest, for the time being at least – until async is out of beta – for publishers to stick with the sync. The small benefit of post content loading first is only beneficial for a site that loads extremely slow. Good luck with your projects! Thanks Ed i am definitely lucky then because my own story goes the other way round. Thanks for your contribution. I was hoping to read your recommendations. Which gave you finally switched to? Are you still with the old code or did you move to the new code? What type of ads are you using now? As in what loading method. i switched back to synchronous ad type for a few days to check something. What type of ad loading do you prefer overall? Why do you prefer that method? Asynchronous ad typs is better since it won’t slow down your site. Hello! Do you know how to put asynchronous ads between the posts? Use Ad Injection plugin to insert adsense between posts.